If you have dark brown eyes, you are really lucky that you can wear any kind of marked cards contact lenses that we have. Here we have two kinds of marked cards contact lenses which are specially for brown eyes. 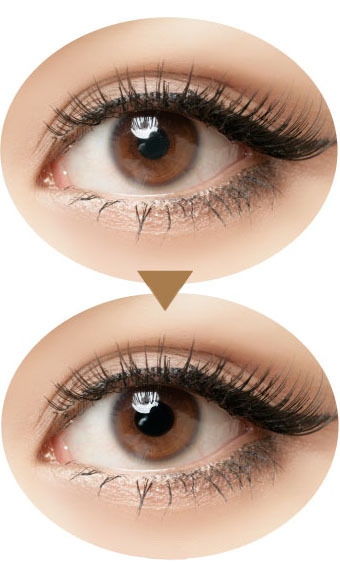 Big dyed circle contact lenses poker are the best choice for people with brown and black eyes. These marked playing cards contact lenses will not change your eyes' original color, but your eyes' color will be a little bit darker than before. However with this special poker reader, marked cards contact lenses, the effect of seeing the marks on the back is the best. What's more, the price is cheap. According to different customers' prefer, customers can chose the marked playing cards contact lenses which can see the marks much more clearly than the surrounding environment. We also have another contact lenses both can see the surrounding environment clearly, but may see marked cards not as clearly as the brown eyes playing cards contact lenses that we mentioned before. Small dyed circle marked cards contact lenses are suitable for some professional poker players who are worried very much about to change their eyes' color a little bit. Since this kind of invisible luminous contact lenses only cover the pupil of people' s eyes, people can see the marks very clearly. With the newest high technology, these poker cards contact lenses avoid the traditional problem of pupil auto focus under different light. Of course, the price for these marked cards contact lenses is higher than the normal brown eyes' contact lenses. If you please the playing cards game Texas Holdem, then you can choose our marked cards contact lenses to see infrared ink easily. All of our poker products are with top quality! Please feel free to contact us to buy the best quality marked cards contact lenses.